Posted on December 24, 2014 by Megan V.
Do you know who Charles Darwin was? Sure, scientists (mostly biologists) love him for theorizing evolution and the church hated him for trying to say that God didn’t create the world in seven days. But how well do we really know him? 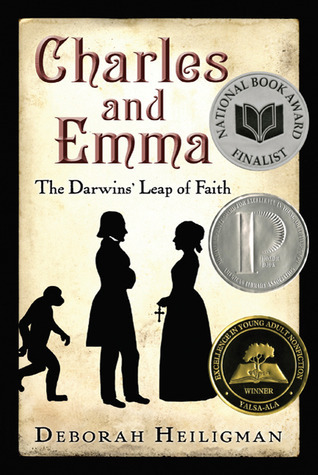 This award-winning book goes deeper into Charles Darwin’s life after he made his voyage and tells the story of his God-believing wife Emma, their faith together, and how Darwin struggled with knowing that not many people of his time would accept his book. This book is completely nonfiction, but quite interesting. The book tells the story of Charles’ life: his list of reasons for marrying and not marrying, how he proposed to Emma, their ten children and what happened to each of them, and how Charles was the type of the perfect father, and not the stereotypical horrible, distant father of Victorian times. It also talks about Emma, and it interesting to see her point of view, especially with his works. The book also does not end with Charles’ death, but actually with Emma’s years later. Additionally, for science fans out there, Charles’ research is mentioned a lot in this book, and it is also shown how he used his research in his daily life. For example, the book talks about how he compared his children’s behavior to that of baby animals. Finally, it is also a love story for romantic enthusiasts, for the book is simply about a couple and their undying love for each other, the hardships that followed, and the conflicting views of theirs that could harm their relationship. Like it was said earlier, the book is completely nonfiction, but it is very good and should be suggested to try out. This entry was posted in Book Reviews and tagged nonfiction by Megan V.. Bookmark the permalink.